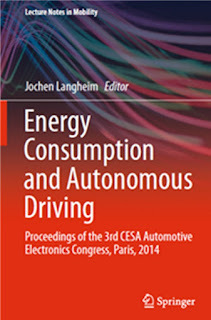 After some months of work, we are happy to announce today the arrival of the lecture notes of CESA edited by SPRINGER under the title "Energy Consumption and Autonomous Driving". Authors received a free copy. For the next edition we are already planning topics and keynotes. It will take place on November 16 and 17, 2016 again in the South of Paris. Save the date now !